L-arginine is a chemical building block known as an amino acid. The "L" in the name refers to the left-handed configuration of the molecule. Amino acids form the molecular foundation of proteins. Arginine in particular also has several specific functions. It's a precursor for the synthesis of nitric oxide, which causes blood vessels to relax, and it reduces the healing time of injuries. Arginine has multiple health applications that can benefit your health, but if you are pregnant you need to use caution. L-arginine is a semi-essential amino acid. This means that your body produces most of the arginine it needs independent of consumption. Under certain conditions, however, arginine must also come from your diet. Dietary sources of arginine include meat, seafood, dairy, granola, oatmeal, nuts, seeds and soybeans. Health companies also produce supplements of arginine to help with deficiencies and health problems. Supplements should not be taken with medications for high blood pressure or with nitrates, that improve blood flow to the heart, according to MedlinePlus.com. Pregnant women may use L-arginine to reduce high blood pressure -- a serious condition known as pre-eclampsia that results in the constriction of blood vessels. It's one of the leading causes of maternal and neonatal mortality. Arginine can also improve the health and growth of the fetus in pregnant women with pre-eclampsia. The disease may have many causes, but one hypothesis for the potential origin of pre-eclampsia is that a deficiency of arginine, due to its effect upon the synthesis of nitric oxide, affects the plasticity of blood vessels in certain high risk individuals. 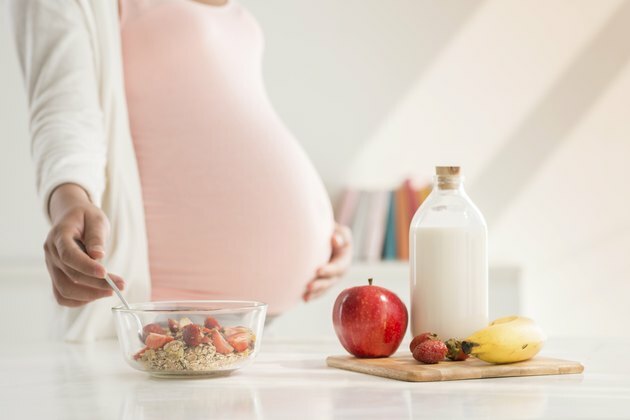 A 2011 study published in the "British Medical Journal" found that medical food containing both L-arginine and antioxidant vitamins significantly reduced the incidence of pre-eclampsia in a population at risk for the condition. Women in the study began the treatment 14 weeks into pregnancy. However, MedlinePlus.com notes that arginine may not be effective in treating pre-eclampsia, meaning that further research is still needed to confirm the existing results. Most of the evidence suggests that L-arginine works best early in pregnancy. It may not lower diastolic pressure -- the pressure of the blood when the heart is at rest -- for women with pre-eclampsia in their 28th to 36th week of pregnancy. Talk to your doctor first before taking L-arginine or any other dietary supplements. MedlinePlus.com explains that L-arginine may be safe for pregnant women when taken for a short period of time, but since not enough is known about its affects during pregnancy you should avoid using it. More research is needed to determine whether there are any side effects associated with long-term use. What Are the Dangers of L Arginine?